T-Mobile wants to give three lucky winners a chance at winning round-trip airfare anywhere in the United States so they can spend the holidays with the ones they love. That’s right, three lucky winners will win round-trip airfare and all you have to do for your chance…is fill out a form on Facebook. There is a catch however, T-Mobile wants to know why you should be chosen as the winner and asks “Why should T-Mobile send you home for the holidays?” Well, why should they? No purchase is necessary and by filling out the form you are only providing your information to T-Mobile and not to Facebook and let’s face it…T-Mobile is likely to already have your name, phone number and email address. The sweepstakes began December 6 at 9am and runs through December 14th at 9am. All times are Eastern Time. Your “essay” can’t be any longer than 100 words and make sure you double-check your entry since it can’t be changed or altered in any way after you send in your submission. 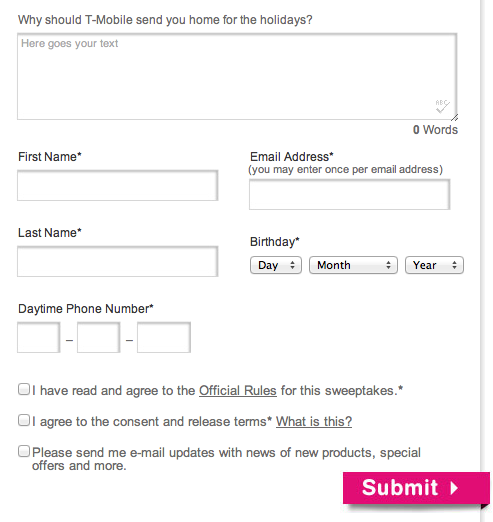 I’m sure I wouldn’t be able to win but if T-Mobile wants to send me anywhere round-trip that has snow this holiday season, I’d gladly accept. I love Florida but they holidays just aren’t any fun in 80 degree weather. Also check out T-Mobile’s “Home for the holiday surprise video” featuring a very special guest. Hummm funny thing is, everyone will want to visit family in Maui! Will they pay for my Xanax and alcohol also just so I can “deal”? I bet some people will think this is some form of punishment (like being forced to watch The View). Family will provide the alcohol, you can get 90 days of generic Xanax at Walmart. Double up if you really need it! What if my family lives close by (one town over) and I don’t want to go home? I think I have a distance uncle in Hawaii or Australia or Europe or somewhere sunny. Pick family or friends in a spot you’d like them to be.